I've been home for the holidays for 48 hours and so far I've made five batches of cookies and peppermint bark. I've spent the majority of my time in the kitchen! I came home with a full list of Christmas baking and I've completed it all! I want to make more but there are only so many mouths to feed! Ontario was struck with quite the storm over the last two days. I drove through some ugly snow conditions to get here on Friday after work and since then Toronto has experienced the largest ice storm ever and we've got more snow than we know what to do with. Winter is here in full force and I'm not sure I'm really enjoying it. But on the plus side, Christmas is three days away and my fingers are crossed that everyone has their power back on by Wednesday! I saw these chocolate thumbprints on Pinterest and knew they would be perfect with a cup of tea. I kept telling my mom that I was making mint chocolate thumbprints and yesterday, while reading through the ingredient list I couldn't find anything that would make them mint! I told my mom and she reads the recipe, looks at me and tells me why: "Emily, that's because they're called mini chocolate thumbprints!" Well no problem then, I made them mint and they're awesome! 1. Preheat the oven to 350*F. Cream the butter and sugar until smooth. Add 1/3 cup cocoa powder and mix until incorporated. 2. In a separate bowl, combine flour, salt, baking soda and baking powder. Add to the butter mixture and mix until combined. Roll into small balls and make an indent with your thumb. Bake for 8 minutes or until they are lightly cracked on the surface but still soft. When they come out of the oven, press the centre down again to make your thumbprint more defined for the frosting to sit in. 3. Whisk together cocoa powder, icing sugar, hot water, peppermint extract and vanilla. 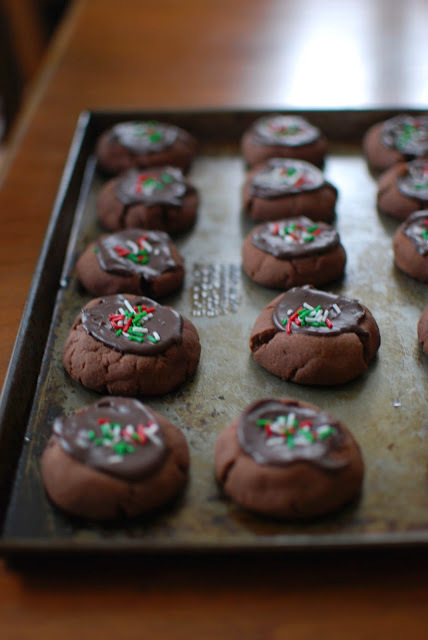 Spoon the frosting into the wells of the cookies and add holiday sprinkles if you'd like! Allow for the frosting to harden before storing. There are a million gingerbread recipes out there but I did make (what I think, anyway) are beautiful gingerbread but I've got a few other things that I'm going to post instead. So here they are tacked on to the end of this post! I made the pattern in the rounds by using some of the china in my mom's curio cabinet. I think they're gorgeous! Hopefully my eggnog cookies (they are as delicious as they sound!) will be what's next on here! But until next time, happy making!